All Four Love: Wordless Wednesday: Big News! 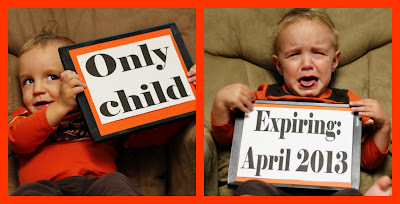 C has some news to share with you! Ha ha! That is adorable!! Love it! Congratulations! You will have to be home for three... plus one! Congrats! Cute way to share the news. I'm due in March with #2. I will be back to read your updates! Thank you, ladies! We're so excited! I'm not quite sure, however, what do do about my blog title! Home for Four just doesn't have the ring to it. lol Oh well, I'll have to put my thinking cap on for this one.